The technology of large scale seasonal thermal energy storage (STES) has been investigated in Europe since the middle of the 70's. First demonstration plants were realized in Sweden in 1978/79 based on results of a national research program. Borehole thermal energy storage (BTES), which is also referred to as duct storage, has been successfully used for seasonal heat storage in a number of large solar systems. Some of these systems utilize a heat pump to upgrade the stored energy to the load temperature while others use the stored heat directly without upgrading. Borehole thermal energy storages have also been used for storing cold. BTES use the heat capacity in a large volume of native soil to store thermal energy underground. The soil itself is a very good medium for large heat storage systems since it is no-cost, already on-site, involves minimal excavation, is non-toxic and has a reasonable heat capacity. Much of the cost of a BTES is in the heat exchanger used to transfer heat to and from the soil, the drilling of boreholes in which to install the heat exchanger and in the insulation which is placed over the top of the store. For smaller storages (up to 5 000 m3) typically an insulated steel tank is used but for large storages a BTES can be considerably cheaper per unit volume of water-equivalent storage. Borehole thermal energy storage (BTES), which is also referred to as duct storage, has been successfully used for seasonal heat storage in a number of large solar systems. Some of these systems utilize a heat pump to upgrade the stored energy to the load temperature while others use the stored heat directly without upgrading. Borehole thermal energy storages have also been used for storing cold. BTES use the heat capacity in a large volume of native soil to store thermal energy underground. The soil itself is a very good medium for large heat storage systems since it is no-cost, already on-site, involves minimal excavation, is non-toxic and has a reasonable heat capacity. Much of the cost of a BTES is in the heat exchanger used to transfer heat to and from the soil, the drilling of boreholes in which to install the heat exchanger and in the insulation which is placed over the top of the store. For smaller storages (up to 5 000 m3) typically an insulated steel tank is used but for large storages a BTES can be considerably cheaper per unit volume of water-equivalent storage. 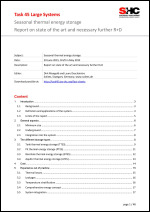 The purpose of this document is to provide useful guidelines for BTES design and implementation including information on how BTES performance and solar system performance are affected by a wide range of soil properties and by the shape of the BTES field, in terms of the ratio of its diameter to its depth. This information can be beneficial to the designer since in the early stages of system planning and design, soil conditions and water table depth are often unknown. In all cases, it is assumed that a BTES would not be utilized if there is a significant water movement through the bore field since the result would likely be unacceptably high heat loss. 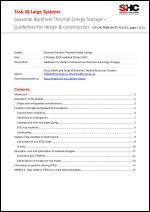 The sensitivity results in this Tech Sheet are based on more than 1000 TRNSYS simulations of solar systems designed to meet a large fraction of the heating load at supply temperatures that are less than 40 C for most of the winter and always less than 55 C, without heat pumps. However, the results may also provide guidance for systems using heat pumps and those with higher delivery temperatures. The same systems were also simulated in 5 different Canadian climates. Seasonal pit heat storages has been investigated and implemented in Denmark both as pilot storages and latest also as full scale storages in Dronninglund (SUNSTORE 3) and Marstal (SUNSTORE 4). 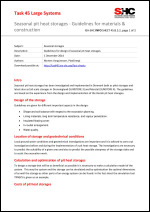 The guidelines are based on the experience from the design and implementation of the Danish pit heat storages. 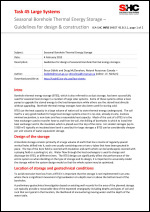 Seasonal heat storages in connection to large scale solar plants for district heating has been investigated and implemented in Denmark. For full scale systems the storages has been made as pit thermal energy storages (pit heat storages). In addition to this a borehole thermal energy storage has been implemented as a pilot plant. 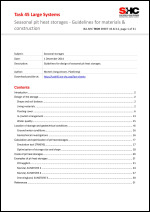 This fact sheet is a design guideline for pit heat storages based on experience from the design and implementation of the Danish pit heat storages. In principle a pit heat storage is a large water reservoir for storing of thermal energy. Water is an excellent medium for heat storing as it is cheap, non-toxic and has a high heat capacity. The cost of a water storage mainly consists of the parts surrounding the water: A watertight tank and a thermal insulation. For smaller storages (up to 5 000 m3) typically an insulated steel tank is used but for larger storages a pit heat storage is considerably cheaper per m3 water (app. 1/4 of a steel tank).